The already well-saturated San Diego area was in line for more showers Friday, though on a much milder scale than the drenching the region experienced last month. 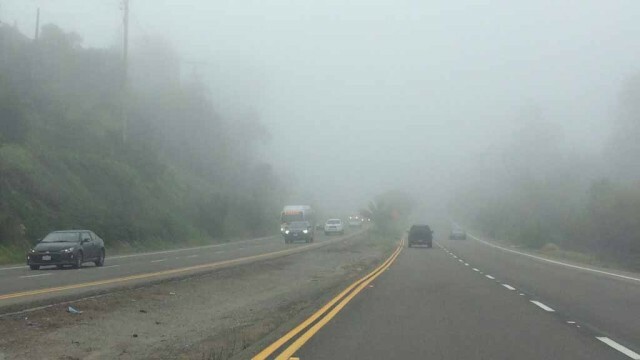 A heavily foggy morning in local coastal communities and as far as 15 miles inland gave way to partly cloudy skies in most locales by midday, according to the National Weather Service. Showers were expected to begin dousing the county — starting with its far-northern reaches — Friday evening, possibly as early as 8 p.m., meteorologist Derek Schroeter said. The low-intensity storm will drop about one-tenth an inch of moisture near the ocean shoreline, one-quarter to half an inch in the mountains and a tenth of an inch or less in the deserts, forecasters predicted. The cloudbursts will largely be over with by early Saturday, though a chance for isolated drizzles will remain through the rest of the day, Schroeter said. Anticipated precipitation totals include 0.01 of an inch in Borrego Springs, 0.09 in San Diego, 0.12 in Oceanside, 0.13 in Miramar, 0.15 in Escondido, 0.17 on Mount Laguna, 0.18 in Ramona, 0.24 in Alpine, 0.38 on Palomar Mountain and 0.4 in Julian. A high-surf advisory was slated to remain in effect until 8 p.m. Saturday. Following the departure of the unsettled atmospheric system, fair and warmer conditions will prevail prior to the expected arrival of a more significant wet spell late next week, according to the weather service.